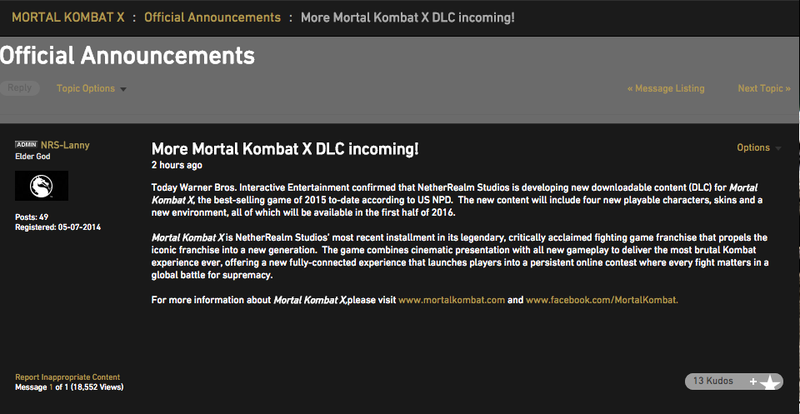 If you were anxiously waiting for a major announcement today from NetherRealm Studios regarding future DLC kontent for Mortal Kombat X, you’ll be sorely disappointed. While there was an announcement posted on the WBGames community forums, there was no information that we hadn’t already guessed for ourselves with the aid of Ed Boon’s kryptic Twitter postings. Four new characters have been confirmed along with skins and a new environment to slug it out in. Beyond that the only new information is that we won’t be able to get our hands on this until the first half of 2016. The timing of the announcement relative to it’s actual release seems odd to me, but hopefully we can start getting concrete details on who these new characters actually are. Several characters have been hinted at including Rain, Baraka, and even the Alien from the Alien films. Mortal Kombat X’s roster is already robust, adding more fan favorites and possibly yet another Hollywood horror icon would only make it that much better. Here’s hoping we can see Alien and the Predator square off in Mortal Kombat X in 2016.